In the spirit of Modernism, Beatriz Ball's MID-CENTURY Collection reinterprets classic designs utilizing practical materials for the ease of today's lifestyles; shapes that are fresh and relevant for a new century. We call it "Millennial Modern." 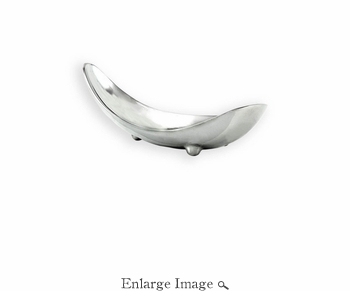 Our swoosh-shaped and footed MID-CENTURY Oslo Medium Bowl is a perfect example. Boasting a shimmering easy-care surface, and sleek, curvy and sophisticated design, the medium Oslo is a fine serving bowl for little nibbles, or a handy container on the vanity, desk, or bedside table. The medium Oslo bowl is one you'll enjoy every day. The medium Oslo is great on its own, and works well with our small size, too. It makes a welcome gift for anyone on your list, from hip millennials to nostalgic boomers! Made of a top quality, FDA safe, easy-care, oven and freezer friendly aluminum alloy.